Rate: $85 USD per person. Includes: Transportation, tropical fruits, bilingual guide, equipment, lunch. 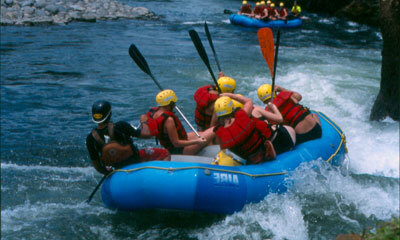 Costa Rica is home to beautiful world Class Rivers for the sport of rafting. You will see many birds, lots of rainforest wildlife, and great views of the Arenal Volcano. The Balsa River is ideal for first time rafters, and is rated class 2-3 with rolling rapids to float upon. This is an ideal half-day tour because it is very close to la Fortuna. The length of the Balsa River is approximately 7 miles long and offers 25 rapids, taking about 2 hours to complete. Note: Allowed age 10 years.